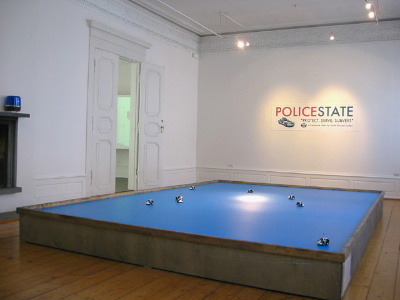 PoliceState – 2003 | JONAH BRUCKER-COHEN, PH.D. PoliceState – 2003 – JONAH BRUCKER-COHEN, PH.D.
A **Carnivore** Client: Protect, Serve, Subvert. 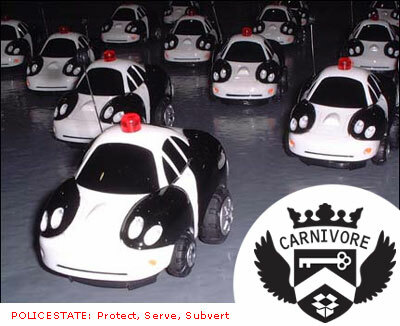 PoliceState is a Carnivore client that attempts to reverse the surveillance role of law enforcement into a subservient one for the data being gathered. 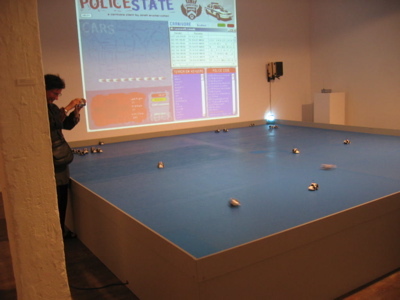 The client consists of a fleet of 20 radio controlled police vehicles that are all simultaneously controlled by data coming into the main client. The client looks for packet information relating to domestic US terrorism. 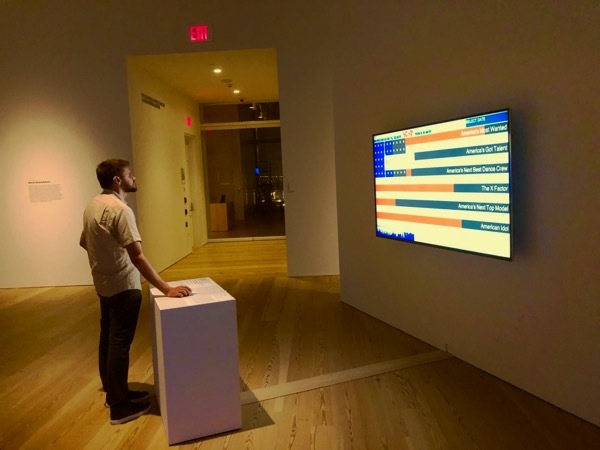 Once found, the text is then assigned to an active police radio code, translated to its binary equivalent, and sent to the array of police cars as a movement sequence. In effect, the data being “snooped” by the authorities is the same data used to control the police vehicles. Thus the police become puppets of their own surveillance. This signifies a reversal of the control of information appropriated by police by using the same information to control them. 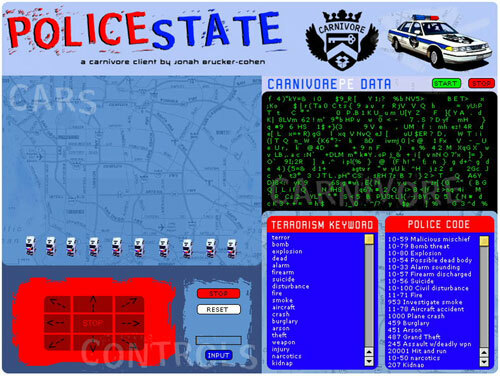 Carnivore is the third incarnation of surveillance software such as Etherpeek and Omnivore created by the FBI to snoop data (email, urls, Instant Messages, etc…) sent through ISPs. Despite the FBI’s justification that using Carnivore advances the war on domestic and foreign terrorism, its use has unearthed many questions regarding its constitutionality. Infringements on personal privacy, free speech, Internet regulation, and the formulation of Echelon – a parsing agent for suspicious words, all bring Carnivore’s existence into question. Carnivore by the Radical Software Group. 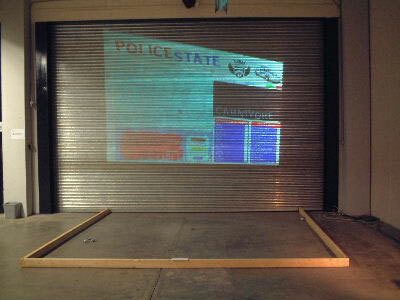 Leonardo New Media Exhibition, Re-Drawing Boundaries, April 28, 2011, Online Art Exhibition. 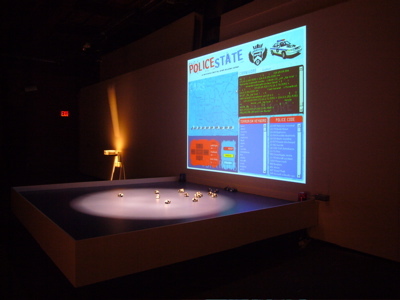 SourceCode, 5/31/07 – 8/11/07 @ Eyebeam, NYC, NY, USA. On The Edge, 11/3/06 – 11/26/06 @ Arhus, Denmark. OBORO, 9/16/06 – 10/21/06 @ Montreal, Canada. Villette Numerique, 9/21/04 – 10/3/05 @ Parc de la Villette, Paris, France. DETOX – Touring Programme, March 26-April 18, 2004 @ Oslo/Trondheim, Norway. 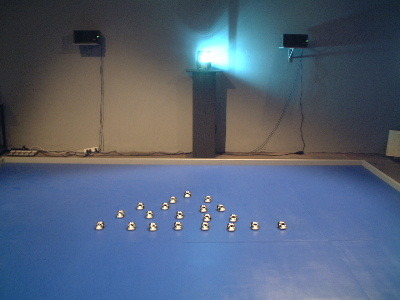 ElectroFringe, October 2-6, 2003, Newcastle, Australia. SuperSonic, July 12, 2003, Birmingham, UK. 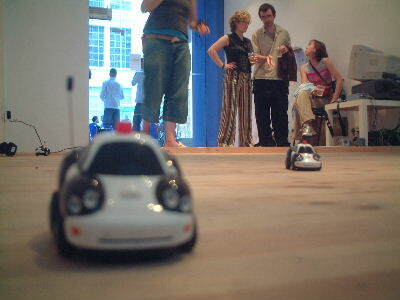 Dutch Electronic Art Festival (DEAF), Feb 25- March 9, 2003, Rotterdam, The Netherlands. 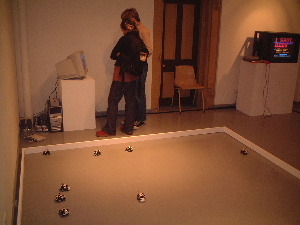 Ars Electronica, Sept 7-12, 2002, Linz, Austria. Darklight Film Festival, Sept 20-22, 2002, Dublin, Ireland. The project consists of a software and hardware component. The client connects to CarnivorePE and grabs incoming packet information from the local network. This data is then parsed and checked against keywords having to do with domestic US terrorism. 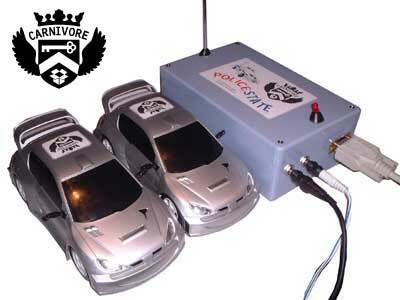 If a word is found it then assigns a police code to all 20 RC cars all tuned to the same 27Mhz frequency which allows them to move together as one. All police codes called refer to possible threats of domestic U.S. terrorism such as “10-79” for bomb threat or “1000” for plane crash. 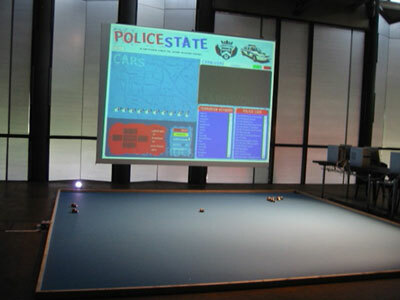 The cars move in tightly choreographed patterns for each police code while sirens sound and a police officer’s voice relays the message over loudspeakers.